Political protest not for sale! Why the Homeland Hack is not a commodity. 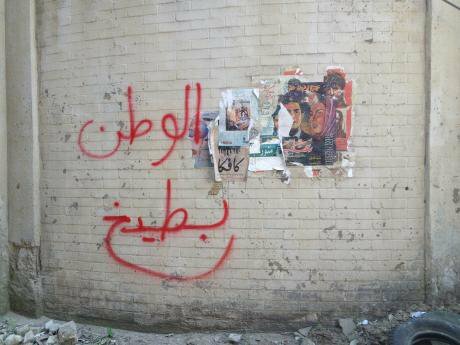 On-set graffiti: “Homeland is Watermelon” Photo courtesy of Arabian Street Artists.In the summer of 2015, operating under the tongue-in-cheek pseudonym the “Arabian Street Artists”, we hacked the award-winning American TV-series Homeland with graffiti. We were hired to decorate the set of a Syrian refugee camp with authentic “Arabian Street Art” and used the opportunity to critique the show with slogans like “Homeland is racist”, “Homeland is Watermelon” and “There is no Homeland”. The intervention went viral when episode two of season five aired and received worldwide media coverage – people from all over the world found their own reasons to celebrate it. Our protest addressed wide-spread grievances on the dangers of stereotyping and catalysed a discussion led by the many people negatively affected by the propaganda machine of media and entertainment industries like Hollywood. In an op-ed piece for CNN, we wrote: “[w]hat makes the show dangerous is that it purports to be critical in questioning the motives of American foreign policy, while at the same time perverting the image of other cultures to one perpetuated by the military-industrial complex.” Reporting on the hack further demonstrated how endemic the problem of stereotyping is, as we were described interchangeably as variations of Arab and Muslim graffiti artists – our own diverse identities distorted to fit pre-packaged tropes determined by editorial biases of the numerous media outlets covering the hack. Three years after our protest opened a world-wide debate, we discovered our own photographic documentation for sale at the Berlin Art Fair without permission or attribution. Nine images of our graffiti were screen-printed in gold by German-American artist David Krippendorff – an “homage” more suitable for the kitsch art markets of 19th-century Munich. He titled the work “This Show Does Not Represent the View of the Artist”, a variation on one of our slogans in singular form. On-set graffiti: “This Show does not Represent the View of The Artists.” Photo courtesy of Arabian Street Artists. Rather than engage in a legal battle, we decided that the ethical implications of this story needed to be discussed publicly. Shortly after disclosing details of the incident online, in a bizarre twist of irony, Krippendorff’s lawyer threatened to sue us for copyright infringement after publishing photographs of “his” prints without permission, further calling into question legislation concerned with derivative artworks. Krippendorff’s antiquated understanding of fair use, as relayed in his public statement, was conveniently not applicable to the use of his content – he was free to sell our Homeland documentation without needing our consent, but we were not free to compare his prints to the original material they are based on without his. From the beginning it was obvious that the central issue is not copyright, but the disparity in the powers at play and the motives driving self-serving and commercial appropriation of political protest. “There is No Homeland” Comparison: ASA vs. Krippendorff. Photo courtesy of Arabian Street Artists. To appropriate the language and imagery of protest is more than to subvert its semantics: it is to subordinate human needs to commercial interests. In 2011, Vodafone released an ad claiming a supportive role in the Egyptian uprising. Activists blasted the company for hijacking their political cause, especially after its complicity in perpetuating the regime’s agenda by facilitating the internet blackout in January 2011. A marketer working from the safety of their office risks very little by creating a campaign based around ideas of change, resistance and uprising; a protester risks professional repercussions and emotional trauma, injury, incarceration, and in some cases, death. Taking to the streets against an oppressive regime for basic human rights, or to protest police killings or wars, or the right to clean water is a public expression of opinion vulnerable to varying degrees of repercussion. Corporate marketing offers an easy solution to societal issues: consume more. It presents the sanitised version of protest, using heroes and inspiring messages, and does away with the tedious debate about what is right or wrong. By omitting process and motive, emotions are served as palatable illusions of fait accompli progress. We saw this go terribly wrong in a 2018 Pepsi ad, in which supermodel-turned-activist Kendall Jenner solves everyone’s problems with a can of Pepsi in under three minutes. Pepsi was called out for their oversimplification of political process and police brutality, reducing public mass protest to a tacky music video. Not only does the company present an offensive caricature of movements like Occupy and Black Lives Matter, but also capitalize on the pain and hardships of others. “Something” Comparison: ASA vs. Krippendorff. Photo courtesy of Arabian Street Artists. Copying without attribution has become ubiquitous due to the ease with which images can now be accessed and reproduced, “like painting out of a tube, anyone can do it,” says art lawyer Sergio Sarmiento. In a recent case of copy-paste, American artist Hank Willis Thomas was strongly criticised for appropriating the work of apartheid-era South African photographers Peter Magubane, Ernst Cole and Graeme Williams and selling them at the Johannesburg Art Fair. Thomas offered to hand over his disputed photographs for a year, a patronising assumption that the artistic merit of the works would eventually be understood and accepted. He evokes censorship as the core of the dispute, by responding, “it’s a dangerous moment when we start to tell people what they can and cannot talk about, what they can and cannot focus on when they’re making art […] censorship is part of the critical tools of the apartheid government, and any oppressive regime”. His insinuation demonstrates an astounding lack of awareness towards his responsibility in exploiting another’s political struggle, in addition to his reprehensible treatment towards the artists he cheated. The issue is not censorship either. Rather, the problem is in the corporatisation of the artist who exploits protest and transforms cultural signifiers into ornamental commodities to be displayed, consumed, stripped of their meaning and impact. In 1998, German artist Wolfgang von Schwarzenfeld uprooted a large stone from Canaima National Park in Venezuela for his Global Stone project, an art installation in Berlin aiming to promote global peace. The Kueka stone, sacred to the indigenous Pemón people, was a point of contention between the two countries for over a decade, as protesters demanded the return of their cultural heritage. “This is all a fraud, a deception,” German anthropologist Bruno Illius said, demeaning their cause by accusing Venezuelan president Chavez of using the Pemón for political propaganda in time of an election. Schwarzenfeld doubled down on his ownership by claiming to have taken all the appropriate legal measures, but whose system of law are we addressing? Legality is not a frame of reference that is fair to groups foreign to specific nationalised systems. Like David Krippendorff and his “homage”, Schwarzenfeld discards historical and cultural connotations in favour of monetisation; they both adopt a colonial mentality, assuming the role of the “legitimate artist” who, by providing a “platform”, apparently injects artistic and economic value into other’s cultural content. Western institutions follow this same logic of legitimization for their stolen artifacts by promoting themselves as the world’s cultural guardians. They argue that indigenous people do not know the value of their own heritage nor do they have the know-how to preserve it, as expressed by La Tribune De L’Art’s managing director Didier Rykner. From this standpoint, any agreement to the repatriation of objects is framed as an altruistic act. Movements such as #decolonizethisplace and artistic interventions like the Nefertiti-hack call out institutions for their unjustified claims and, more specifically, for their complicity in the looting and theft of cultural artifacts from disenfranchised peoples. The prominence of this topic is closely related to the rapidly evolving landscapes of a globalised culture where cultural appropriation requires the power to perpetuate the stereotyping faced by non-dominant cultures in a continuation of their oppression. The message of the movement against cultural appropriation is that the dominant players in colonial and imperial violence can no longer write the narratives of cultures they exploit. Similar to director Todd Holland’s racist fantasy, ironically called Krippendorff’s Tribe (1998) - in which the protagonist invents a fake Oceanic tribe and performs every stereotype imaginable to cash in on a grant cheque- Homeland’s contrived delusion of the Middle East and their fictitious refugee camp saw Syrian refugees reduced to mere props. In our filmic commentary about the hack produced by Oscar-winning director Laura Poitras, we invited a Syrian friend to superimpose his narrative on footage of the set – “the picture has changed today”, says Wasim Ghrioui, “they now know that Syrians come from the greatest butchery on Earth, not from one of the oldest civilisations”.16 Challenging dominant narratives perpetuated in media and entertainment industries has become a matter of survival for marginalized voices. Image of Homeland set. Photo courtesy of Arabian Street Artists. If the above examples serve as reminders of questions that have been asked about appropriation, David Krippendorff’s antics are symptomatic of the many that still need answering. Even within the context of a contemporary post-colonial discourse on identity politics, historiography and appropriation, today’s propagandised narratives are easily overlooked in a constant onslaught of news media, concealed in sound bites distorted by online discussion. Calling them out becomes ever more crucial. Artists and activists in communities persecuted for critical dissent understand what is at stake: creativity is one of the last bastions of political expression when oppressors lay claim to all other spaces for themselves. Not only does it offer methods to fragment hegemonial mono-narratives, it offers tools with which to resist, and occasionally reclaim them for the people. Some acts of creative protest become symbols, reminders that the outraged voice of the oppressed has the power to make itself heard. Appropriating these critical works by calling upon biased legal frameworks and asymmetrical historical readings, especially under the guise of “high culture”, reflects prevailing attitudes towards the direction in which power flows. This colonial mindset cannot be allowed a voice in protests against it.